Back in April of last year I got an idea in my head that I just couldn’t let go. One year later, after much handling of my first fleece, I have finally cast on a project with the yarn I created from the first fleece I purchased. What a long journey. What a time investment. What an addiction. I’ve learned so very much in just one year with just one fleece. And I can truly say I don’t want to stop any time soon. What this first fleece is knitting into is just beautiful. It is soft, squishy, interesting, and the cables show up very well. I just can’t put it down, simply because I am working with something that I invested so much in. I really do have other things I should be working on, but we are going to let this current addiction just run its course. 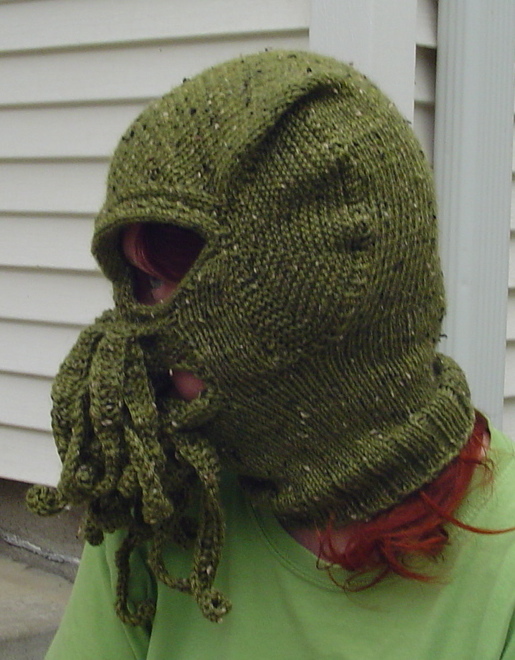 I am not even sure how or why I decided to knit this. Was it the excuse to purchase dyeabolical’s Fate, PhD colorway? Was it the opportunity to get my hands on a not yet released pattern for free? Was it the call of something new? I don’t quite know. 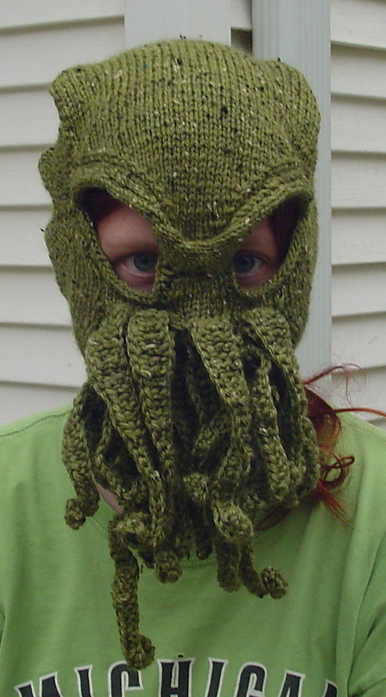 However, I am glad I did knit it. 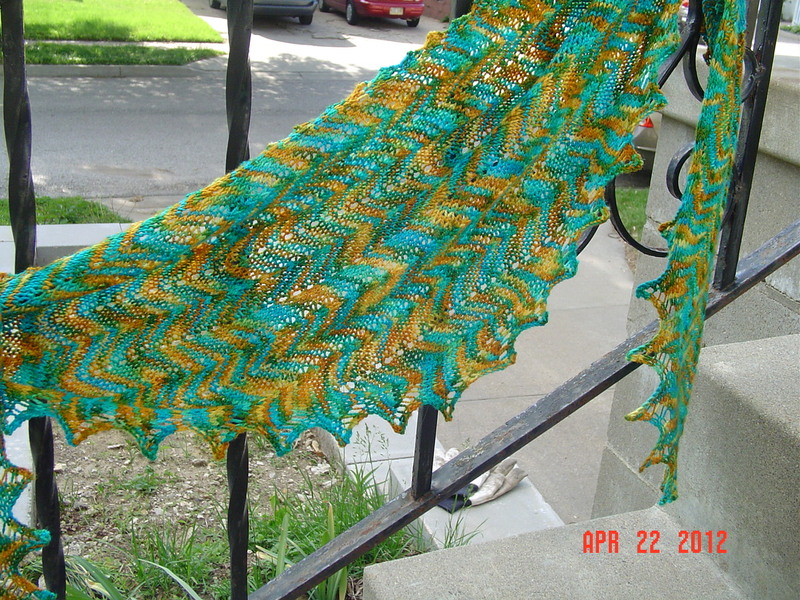 It is a great little shawl, looks fantastic in many drastically variegated yarns, and I love the unexpectedly sideways lines of it. In fact, I enjoyed it so much I felt the need to take 4 pictures to show off. I fondly remember my Nana and my aunt making rag rugs of various sorts. They were often made from old fabric or old t shirts. 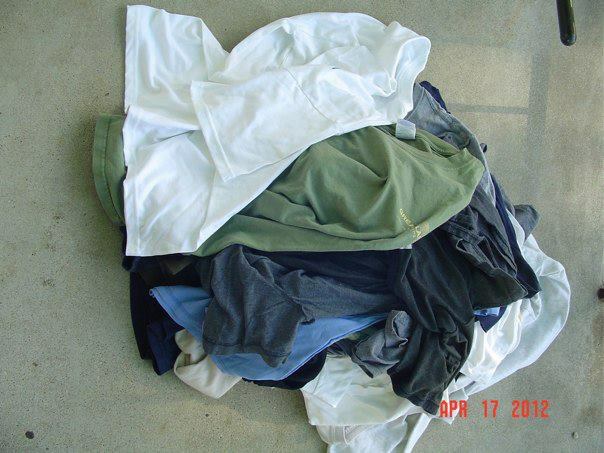 Jason, in all his moving, mentioned that he needed to go through his t shirts and get rid of some. 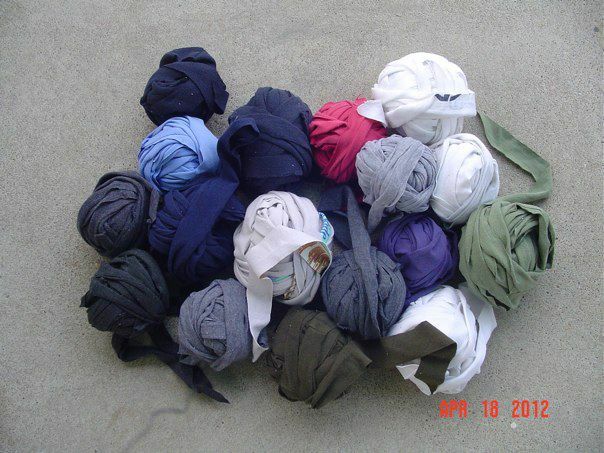 I knew I needed to do the same, and I thought “Why can’t I make my own rag rugs?” So I asked for Jason’s t shirts and I went through all my t shirts, and ended up with a pile to turn into yarn. Many of the t shirts are light colored, which is fine. But, I rather think it might be good fun to also dye some of them in order to add to the color scheme. I’ve got some dyes around that should work on cotton if the correct fixer is applied, so once I have the yarn created, I’ll see what colors I can make out of the lighter t shirts. In reality I am only about half done with that process. I need to keep cranking these pay it forward 2012 projects out, and so I decided to start some work on a hat for a local cycling friend. I had some Rowan Scottish Tweed hanging out in my stash and I figured the black tweedy color would be perfect for a hat for a guy. I just needed an interesting pattern. I did a little digging and figured out that he was secretly pining for a handknit hat in a style of that which Zac Brown of Zac Brown Band wears. Thankfully, this guy seems to have a decent collection of hats, so all I had to do was choose something interesting, and so I located a pattern called Ritenour which interested me and I got started. 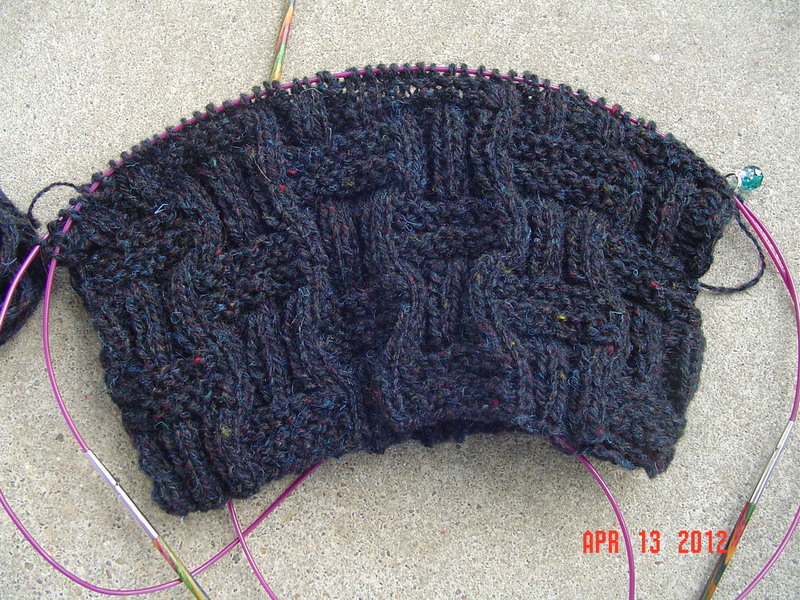 This hat is basically a basketweave pattern. Quite interesting and textured. 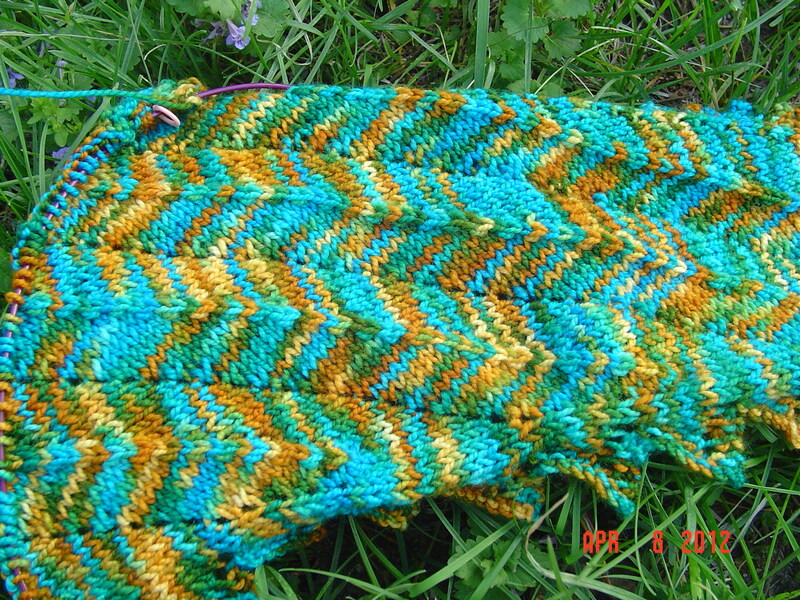 I need to measure it, but I think I am about ready to start the decreases. So, last week I jumped in on an offer for a free pattern to knit in order to have some shawlette examples when the pattern was released. 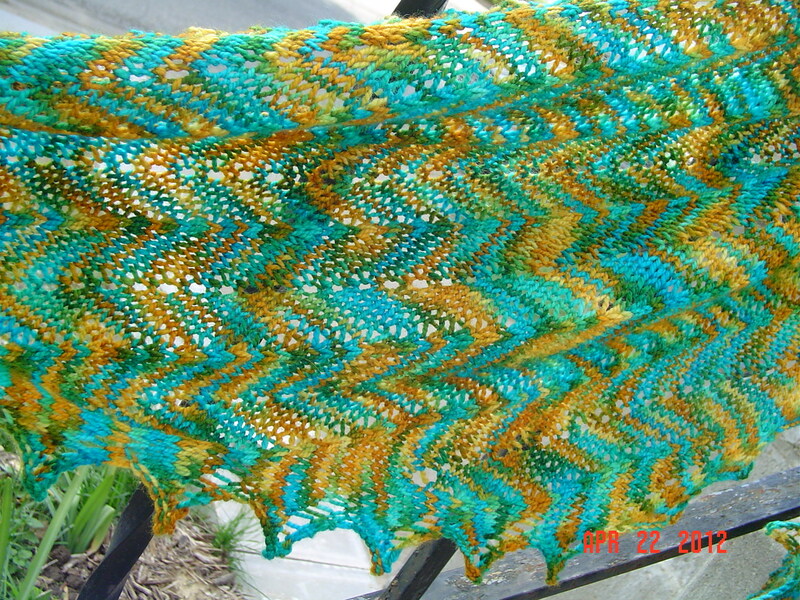 The deal was that I had to use dyeabolical yarn for the shawl. I had a little trouble picking a color, but finally settled on Fate, Ph.D. which I think was a good choice. The shawl has fairly flown this weekend, I only started on Friday evening, but was able to get quite a bit done during dye day. I am thrilled with the progress and thrilled that I had a weekend where there was knitting progress. The day before easter seems like an appropriate day to have a yarn dyeing day. I’d planned it well enough ahead though that I didn’t even realize that it would be on easter weekend. I had just a bit of yarn to dye for myself, some yarn to dye for a friend, and two other friends who wanted to dye their own. 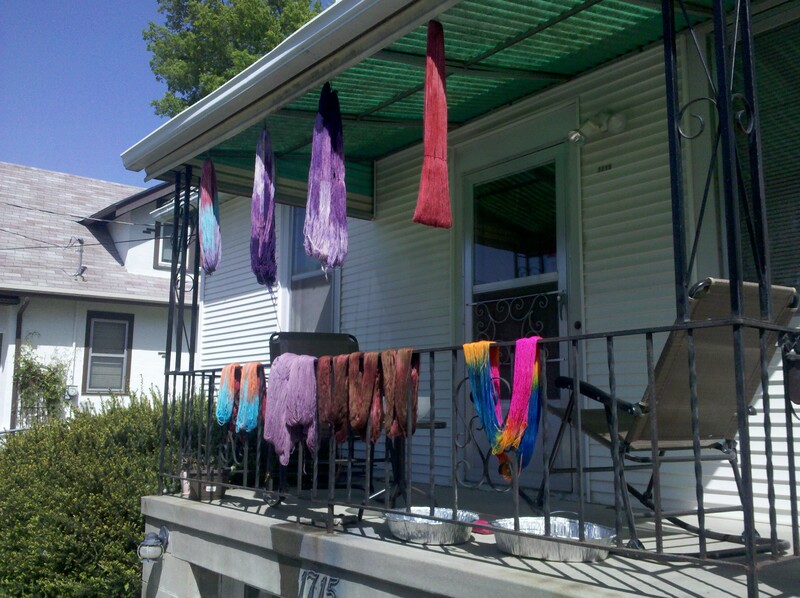 In the end I had 4 other gals in my house either dyeing yarn or helping with the process. 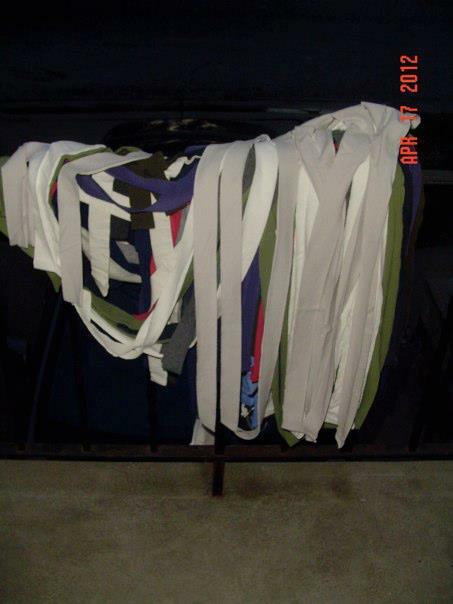 Bug chose that time to dye her easter eggs too, so it was a dye day all around. I tried a new technique for my skeins, and ended up with a little bit of an accident. I burned a few strands of yarn. In the end I doubt I will have lost too much yardage, but it certainly was a learning experience. With mine, I used a large dye pot and loaded up on dye. 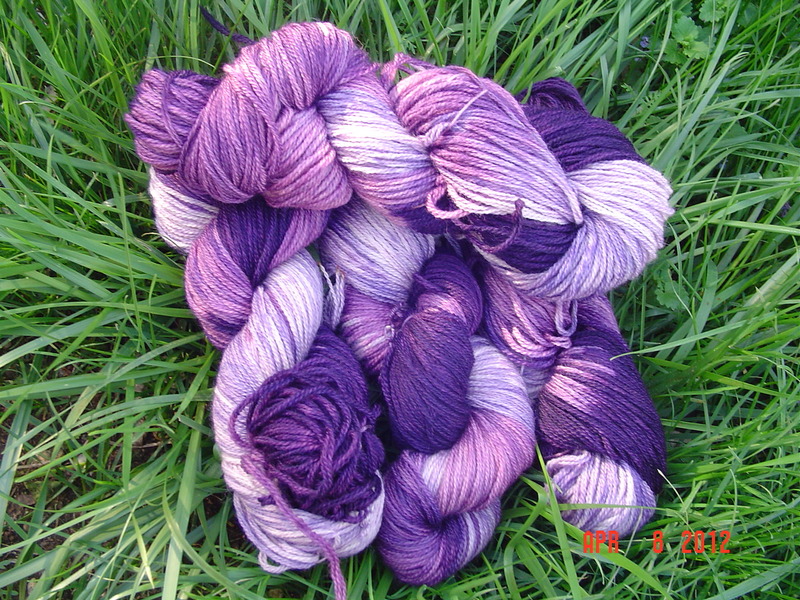 I then added about 1/3 of each skein, and every half hour added another 1/3, so that the dye soaked in much darker initially and the final 1/3 of each skein was more of a light lavender to white. I enjoyed this technique and I loved the results, certainly one to try again. My Cthuluklava, the green thing, it is done. It took forever, but I think it was worth it. 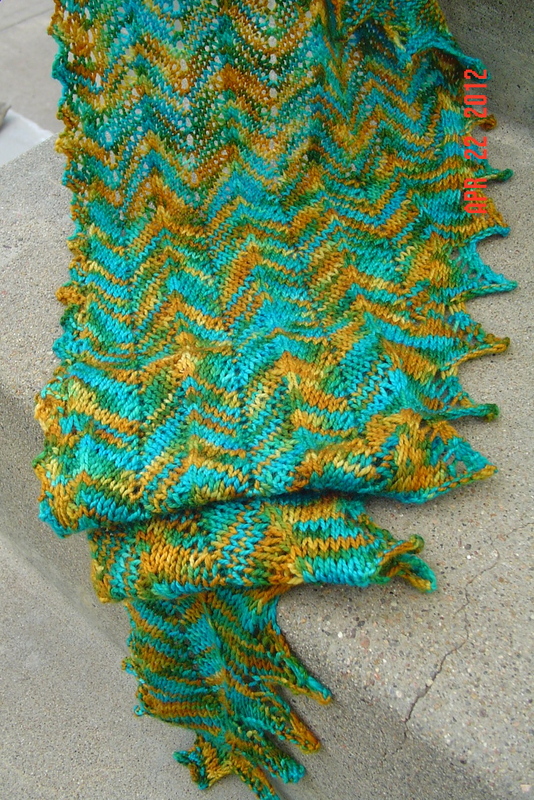 The yarn is knitpicks wool of the andes tweed. 3 skeins and I had only about 5 inches of yarn left when I was done. I modified the tentacles. Instead of making them knit and stuffed, I crocheted them. Additionally, there are 20 instead of 10. The other mod was the sides, or gills as I’ve been referring to them. 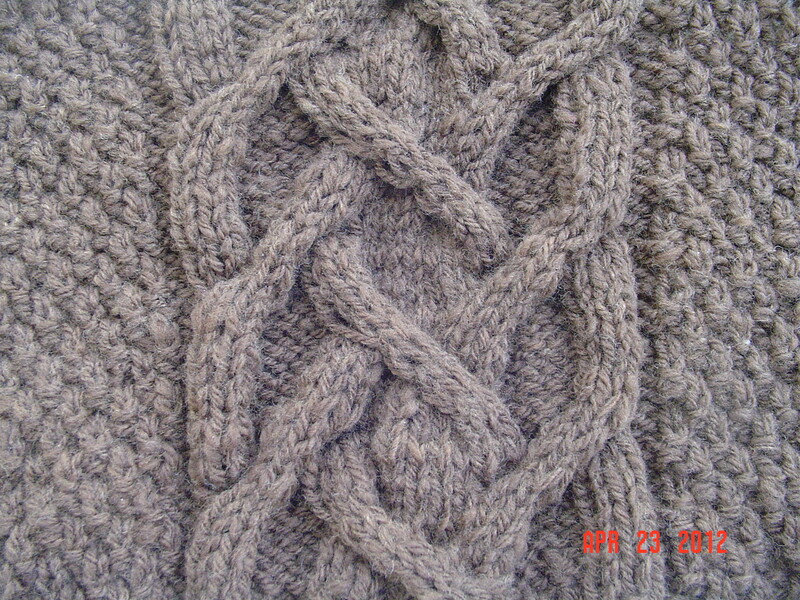 Rather than stockinette stitch, I did them in garter stitch. 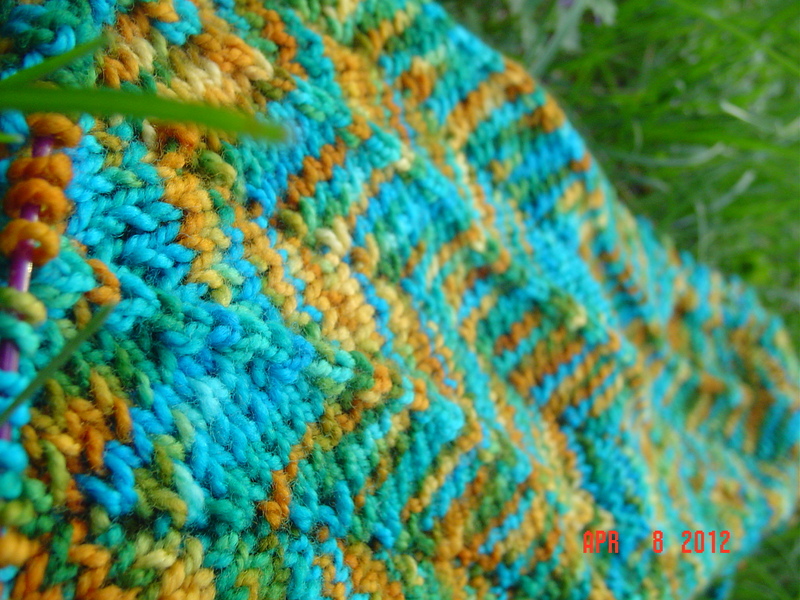 It really wasn’t a terribly long project, it just was somewhat uninspiring because I wasn’t quite sure as to what was going on with the pattern most of the time. I am glad it is done and even happier with the result. It is one more goofy project that rather completes my “Year of Knitting Dangerously.” Not that I’ll stop that any time soon!